A jam-maker's special! 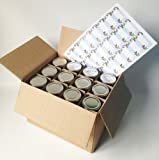 Twenty-four hexagonal glass jam jars with silver lids, all in a sturdy, reusable cardboard jar box plus 24 specially designed fruity self-adhesive labels. All packed and despatched within 24 working hours and delivered with our fast courier service. Fill with delicious home-made jams, preserves, sauces, chutneys and pickles. Then use the box to store further jars, or to transport them! Capacity: 190ml (approx. 1/2lb)Measurements: approx. 9cm (3.5") high x 6cm (2.25") max. diameter. Labels measure approx. 6.5cm x 3.5cm.